A tax is a monetary imposition by a government on persons or property for the purpose of raising revenue to support the purposes of the government. In contrast to an assessment or a fee, a tax need not be levied in proportion to a specific benefit to a person or property. Fees or charges will be considered taxes to the extent they exceed the reasonable cost of the service, commodity or facility for which they are imposed. California Cities do not have an inherent power to tax. Charter cities are given the power to tax pursuant to Article XI, Section 5 of the California Construction and may levy taxes for municipal purposes without specific authorization from the Legislature. 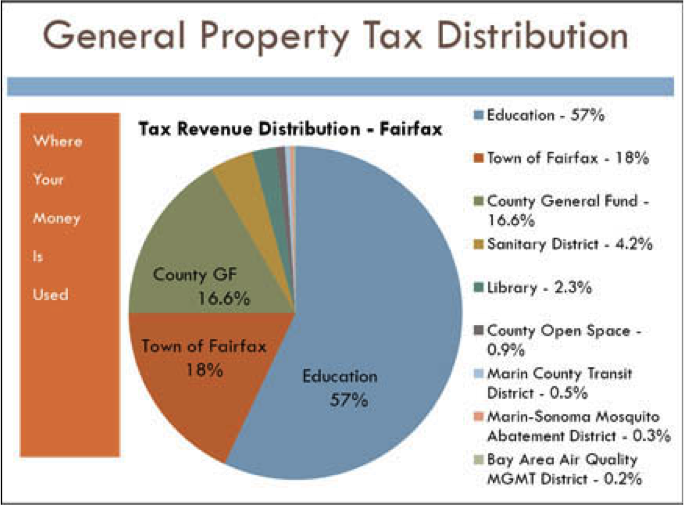 As authorized in state statute, a general law city, such as the Town of Fairfax, with certain exceptions, may levy any tax that a charter city may levy. State law may set certain limits and procedures and may exempt certain activities from taxes levied by general law cities. These laws apply to charter cities in matters that the courts have determined are of statewide concern. The passage of Proposition 13 in 1978 created a distinction between “general” and “special” taxes. Proposition 218, in 1996, further defined and established procedures for general taxes. A general tax is a tax imposed for general governmental purposes, the proceeds of which are deposited into the General Fund. A majority vote of the electorate (those voting on the measure) is required to impose, extend or increase any general tax. An election on a general tax must be consolidated with a regularly scheduled general election of city council members, except in cases of emergency declared by a unanimous vote of the city council. Single-purpose special districts (“special purpose districts”) may not impose general taxes. A special tax is a tax that is collected and earmarked for a specific purpose and deposited either into a separate account or the General Fund. A two-thirds vote of the electorate is required to impose, extend or increase any special tax.